Is the easiest to use and conceal Re-usable synthetic urine kit made. It has been successfully used for over 16 years and never a problem, nor complaint. It needs no batteries, is totally undetectable and allows for the easiest most accurate monitoring of any kit. Our Synthetic urine kits use a realistic flow tube not a skinny iv tube like our competitors . 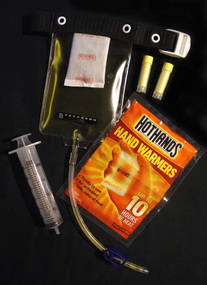 It is a Simple no Gimmicks dispenser that will hold our Fake it synthetic urine at temp all day thanks to our leading 10 hour hand warmers that work as a insulating heat source and your body works as a regulator keeping it from being too hot. No cheap china made warmers here. ​With two 3 oz. lab grade Samples of our leading synthetic urine FAKE IT the only true human equivalent urine that includes everything like proper PH, creatinine to color ratio and uric acid levels, proteins, amino acids, and smell ( no liquid can do this ) . Any made in china prefilled liquid urine knock off making these claims are LYING . And Healthy people do not have foamy urine . Perfect synthetic urine kit for Random use where you need to carry it on you at all times. 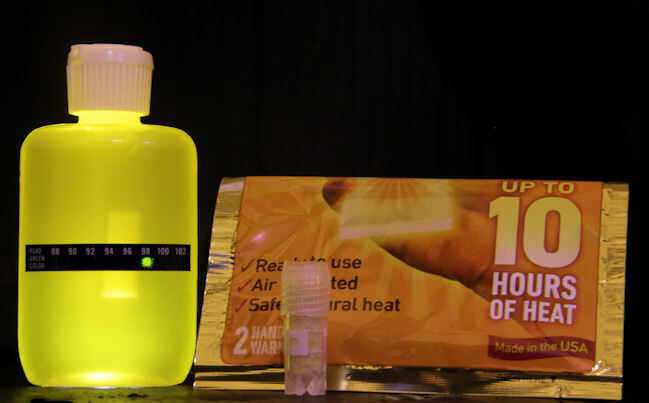 Simply keep warm water in bottle and drop synthetic urine sample in when needed. Flip top cap for single hand use and no cap to drop. Can also be used for pre employment. It is fast, easy and reliable. The One Shot Synthetic Urine kit has never fail a single test. Fake It Synthetic Urine is the 2 ounce version of pass its laboratory urine that is conveniently premixed with urea. Fake it is a unisex synthetic urine for use by either men or women. It contains ingredients normally found in urine and has correct range for pH, specific gravity, creatinine, and several other urine characteristics including urea AS SEEN IN Urine Validity Testing VIDEO . Fake it comes with an attached temperature strip and heating pad to ensure the sample is at proper temperature. Fake it contains two ounces of synthetic urine, the amount required by testing guidelines. All liquid urine is made in china and rebottled the brand name doesnt matter. When you here of failed test from bad batches from quick fix that means they all can fail EXCEPT "FAKE IT " it is a powder concentrate synthetic urine . Q: What is specimen validity testing? A: Specimen validity testing (SVT) is performed on a drug screen specimen to detect substitution, adulteration, or dilution. See the Drugs of Abuse Reference Guide for additional information on SVT. Substitution - Submission of a specimen that is not characteristic of human urine. Typically, this may be water or water with salt in it and is identified by extreme creatinine and specific gravity results. Adulteration - Adding a substance to a specimen after it has been collected. The product added is designed to mask the presence of, or chemically destroy, the drug or drug metabolite that the specimen may contain. An adulterant product may be added with the intention of adversely affecting the testing reagents. Dilution - Result of ingestion of large amounts of water typically just before urine donation or as a result of physiological conditions. Specimens meeting dilute specifications typically are not considered questionable donations. Q: Does the lab conduct SVT before screening for drugs? A: No, specimen validity testing is performed simultaneously with the initial drug screens. Depending upon the drug screen and the specimen validity results, the laboratory will release (1) both the drug screen and the specimen validity test results, (2) the specimen validity test results only, or (3) the drug screen results only. Q: Is the nitrite test threshold based on body functions, or does it allow for infection, food ingestion with high nitrates, and water consumption with high nitrites? A: The nitrite threshold level established by the Federal Government is 500ug/mL. This is based on the level at which a drug screen may be impacted by this adulterant and by which no normal physiological level has been detected. Q: How would a drug test be evaluated when nitrates are 490 ng/mL? A: The nitrite result would be negative, as this level would not interfere with our testing process. The drug test(s) ordered would be conducted and reported following standard operating procedures. THC is the hardest to detox because THC is fat soluble, and it gets stored in your fat cells. Cleaning it out of your lipid tissue is very difficult. Many flushing drinks and herbal products claim to clean out your system, yet they do nothing to remove THC byproducts from fat cells. A study was done in Germany in 1993 on 50 of the most common herbs used by people trying to pass the test. All 50 herbs failed to cause a negative. Unfortunately, this rumor will not die. Goldenseal (plant) is useless; yet it's the most common thing for people to use. Truth is that its the tons of water that dilute levels no any ingredients in the drinks . The only way to extract THC from fat cells is to exercise. Fat cells secrete fat with THC metabolites at a constant rate, regardless of what herbs you consume. You may be able to temporarily clean THC metabolites from your bloodstream, or dilute your fluids to yield a larger urine/THC ratio, but your bloodstream will continue collecting THC metabolites from fat. Your urine will continue collecting THC metabolites from your bloodstream. Metabolites are the byproducts of a substance after it has run through your system. To determine whether you will pass or not, it is important to know how much of the illicit metabolites are in your urine and how much is tested for. Usually marijuana tests will have a cutoff of 50ng/mL. That is the standard in the industry. You might run across the occasional test that has a lower cutoff level (Level of Detection, [LOD]), Home testing can tell you whether your level at the time of the test is above or below the 50ng/mL level, but it will not tell you the exact level of THC metabolites in your system. Learn how to properly read results when doing a Home self test on your urine? Detection times of several drugs. When using a urinary drug test, the best time to determine the presence of drugs is by testing the first urine of the morning, as it is the most concentrated and will yield the most accurate results. The following chart indicates the time period drugs will stay in the body depending on factors such as degree of usage, a person’s metabolism and individual body weight. The detection periods are applicable to both urinary and saliva drug tests. The half-life of THC concentration ranges between 0.8 to 9.8 days. There is too much human variation to even approximate how long THC will be detected in the urine of an individual. Infrequent users with a fast metabolism will have the shortest detection time. Frequent users with a slow metabolism will have long detection times. The only way to estimate a detection time is to consider the lower and upper bounds (5-30 days), and decide based on the factors I've mentioned. NIDA (The National Institute of Drug Abuse) is the government organization responsible for regulating the drug-testing industry. The vast majority of urine drug screens done these days conform to NIDA specs, and ALL testing associated with the government (department of transportation, etc.) complies with the NIDA standard. It is NIDA that decides what the "safe" cutoffs are to avoid false positives.... Despite what you might hear on the net, urinalysis, if done correctly, is a very accurate scientific procedure. I know of no labs that simply report the results of the initial EMIT screening without confirming the sample on GC/MS. The fact is, labs WANT you to test negative, because then they only have to run an EMIT test on your urine (a few cents). If you test positive, they must then confirm the positive result on GC/MS, which is considerably more expensive. Not all labs are NIDA/CAP certified. Some labs do not properly and thoroughly clean the GC/MS equipment. Some labs don't even do a GC/MS confirmation! Some labs use cheap alternative methods to reduce expenses. Many human errors occur in labs and cause inaccurate results. Some are careless or irresponsible errors, and some errors are accidents. Human error can ruin the results of ANY test, screening or confirmation GC/MS.